Writing an essay is like making a hamburger. Think of the introduction and conclusion as the bun, with the “meat” of your argument in between. The introduction is where you’ll state your thesis, while the conclusion sums up your case. Both should be no more than a few sentences. The body of your essay, where you’ll present facts to support your position, must be much more substantial, usually three paragraphs. Like making a hamburger, writing a good essay takes preparation. Let’s get started! Before you can begin writing, you’ll need to choose a topic for your essay, ideally one that you’re already interested in. Nothing is harder than trying to write about something you don’t care about. Your topic should be broad or common enough that most people will know at least something about what you’re discussing. Technology, for example, is a good topic because it’s something we can all relate to in one way or another. Once you’ve chosen a topic, you must narrow it down into a single thesis or central idea. The thesis is the position you’re taking in relation to your topic or a related issue. It should be specific enough that you can bolster it with just a few relevant facts and supporting statements. Think about an issue that most people can relate to, such as: Technology is changing our lives. Once you’ve selected your topic and thesis, it’s time to create a roadmap for your essay that will guide you from introduction to conclusion. This map, called an outline, serves as a diagram for writing each paragraph of the essay, listing the three or four most important ideas that you want to convey. These ideas don’t need to be written as complete sentences in the outline; that’s what the actual essay is for. Once you’ve written and refined your outline, it’s time to write the essay. Begin with the introductory paragraph. This is your opportunity to hook the reader’s interest with the very first sentence, which can be an interesting fact, a quotation, or a rhetorical question, for instance. Forbes magazine reports that “One in five Americans work from home”. Does that number surprise you? Information technology has revolutionized the way we work. Not only can we work almost anywhere, we can also work at any hour of the day. Also, the way we work has changed greatly through the introduction of information technology into the workplace. Once you’ve written the introduction, it’s time to develop the meat of your thesis in three or four paragraphs. Each should contain a single main idea, following the outline you prepared earlier. Use two or three sentences to support the main idea, citing specific examples. Conclude each paragraph with a sentence that summarizes the argument you’ve made in the paragraph. Let’s consider how the location of where we work has changed. In the past, workers were required to commute to work. These days, many can choose to work from the home. From Portland, Ore., to Portland, Maine, you will find employees working for companies located hundreds or even thousands of miles away. Too, the use of robotics to manufacture products has led to employees spending more time behind a computer screen than on the production line. Whether it’s in the countryside or in the city, you’ll find people working everywhere they can get online. No wonder we see so many people working at cafes! 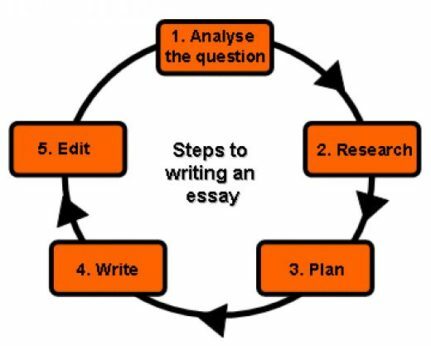 The summary paragraph summarizes your essay and is often a reverse of the introductory paragraph. Begin the summary paragraph by quickly restating the principal ideas of your body paragraphs. The penultimate (next to last) sentence should restate your basic thesis of the essay. Your final statement can be a future prediction based on what you have shown in the essay.